Nicholas obtained his B.S. degree in biomedical Engineering (focused in Biomaterials and Tissue Engineering) at Texas A&M University at College Station, TX. His first research experiences with nanoparticles were at Dr. Akhilesh Gahawar laboratory investigating magnetic nanoparticles and silicate nanodisks (Laponite) as drug delivery carriers for cancer. Prior to that, Nicholas volunteered in Dr. Christopher Quick’s lab developing mathematical models for cardiovascular pathophysiology. Nicholas graduated in May 2015 and joined the biomedical engineering Ph.D. program at UF. 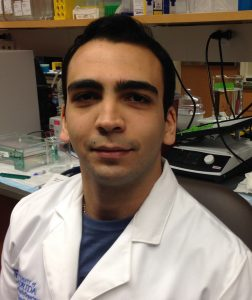 He is currently a graduate student at Dr. Cherie Stabler’s Diabetes Tissue Engineering Laboratory. Nicholas is currently focusing on developing protective, antioxidant coatings for immunoprotection and isolation of pancreatic islets. He is using cerium oxide nanoparticles (CONP) to coat islets and protect against oxidative damage caused by immune cells. Abstract: An oxidative environment is one characteristic of the inflammatory response after clinical islet transplantation; this results in loss of viability and function of beta cells. One experimental approach to address this single condition is to transplant beta cells back into patients while shielding the cells from reactive oxygen species (ROS). 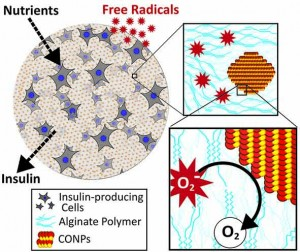 We coated alginate encapsulated cells as well as islet surfaces using cerium oxide nanoparticles (CONP), a ubiquitous and self-renewable antioxidant. CONP (2-3 nm by TEM) with various surface stabilizing groups were studied. Nanoparticle concentration was determined using UV-Vis spectroscopy. In addition to CONP deposition, dendritic polymers having Staudinger ligation complementary end groups were also incorporated via the layer-by-layer (LbL) approach. Such layers imparted covalent stabilization and further functionalization of the coatings. LbL film characteristics (e.g. homogeneity, completeness, and thickness) were studied using fluorescence microscopy. CONP LbL films were not detrimental to the encapsulated cells. Entrapped CONP were catalytically active and significantly decreased H2O2 concentration levels in solution and oxidized the tetramethylbenzidine (TMB) chromogenic substrate. Such catalytic activities were also utilized to monitor stability and self-renewal capacity of the CONP coatings. However, it was noticed that polymeric coatings on CONP diminished its antioxidant activity. Cell viability was also monitored over time to determine effect of such coatings. Complete protection of coated cells against micromolar levels of H2O2 exposure was achieved; however, this was affected by the CONP surface chemistry. Overall, cerium oxide nanoparticles were layered onto alginate beads and islet surfaces. These coatings imparted antioxidant benefits to the encapsulated cells.